Bats are one of the best natural defenders against the arial attacks from mosquitoes and other flying pests. Each bat can devour over 1000 flying insects every evening. They are interesting to watch as they streak through the twilight skies, swooping and diving to grab their prey on the wing. Though bats are one of the most beneficial predators in suburban areas, they are also one of the most miss-understood and under appreciated backyard inhabitants. They are also declining in many areas across the country, primarily due to the loss of habitat for adequate nesting and roosting sites. You can help preserve a healthy and diverse wildlife ecosystem by inviting more bats into your backyard habitat with these bat box plans for an easy to make and decorative bat house. 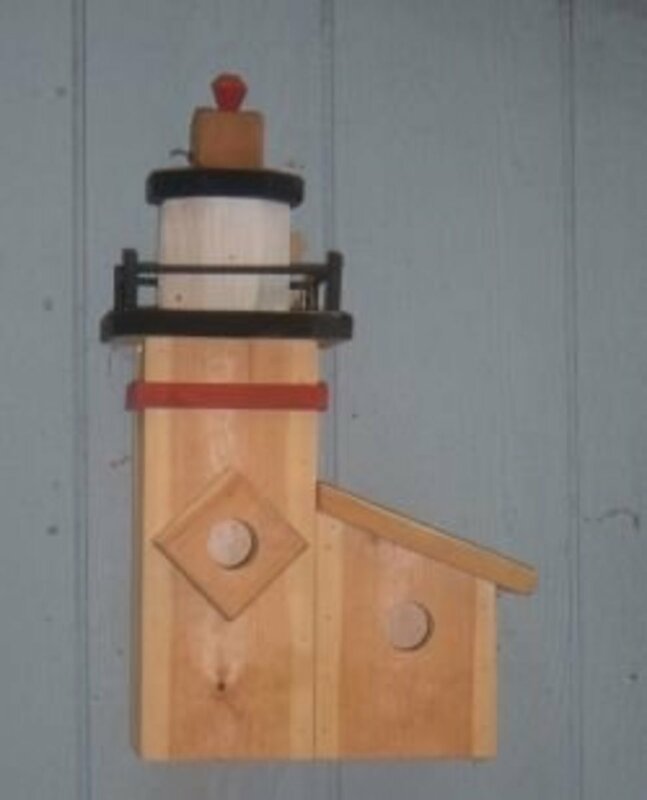 Bat houses can be made from nearly any of the wood products found at your local home center and lumbar yard. Cedar and pine boards are readily available, easy to work with, take paint very well, and are economically priced. 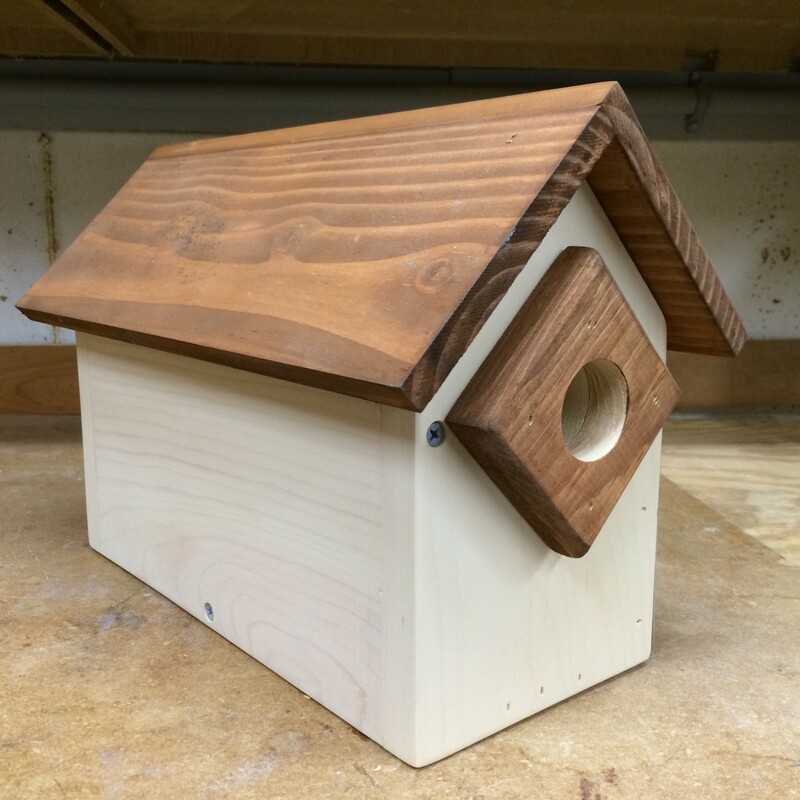 Exterior plywood is another suitable option, especially since the finished bat box will be painted or stained. Exterior plywood is also available in sheets and half-sheets up to 4 feet wide, which makes it easier to construct larger bat houses rather than edge joining cedar or pine boards to form wider panels. For this project, I selected a 1 x 12 pine board which was 8' long and I had plenty of material to complete the project, plus some leftovers for my scrap bin. The actual dimension of the 1 x 12 board is approximately 3/4" thick by 11 1/4" wide. Look for a board that is flat (not cupped) and has relatively few knots. 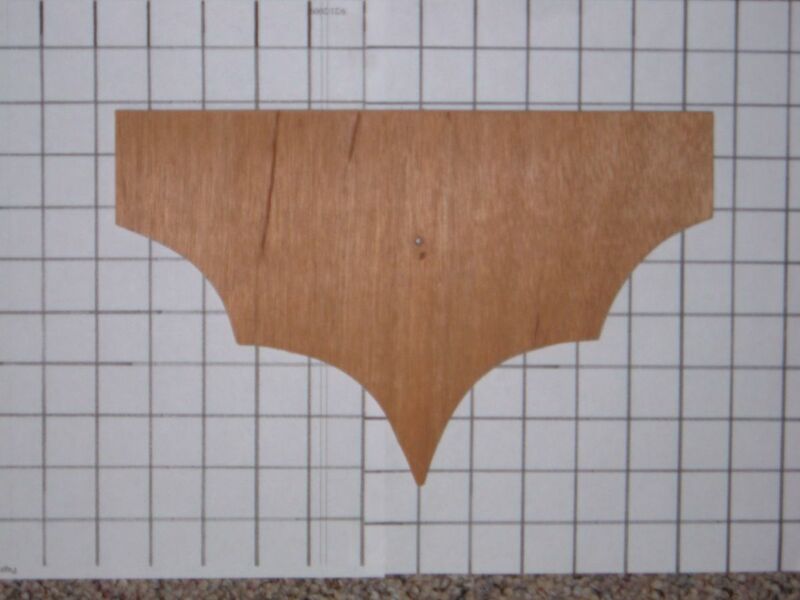 The bat logo was cut from a piece of thin plywood. The pieces for the back (part C) and the front (part D) of the bat box are cut at a 22 1/2 degree bevel across the top, to fit tightly up against the sloped roof. I used a table saw with the blade tilted to 22 1/2 degrees to make this cut, but a circular saw with the blade set to 22 1/2 degrees will work too. The side pieces (part B) of the bat house each need a 22 1/2 degree cut at one end to accept the roof, and either a handsaw or a power miter box saw works well for this cut.The finished side pieces will measure 13 1/2" from the longest point to the bottom end of the piece. Cutting the length a bit long will allow the sides to be trimmed (if necessary) when fitting the bat box together for final assembly. 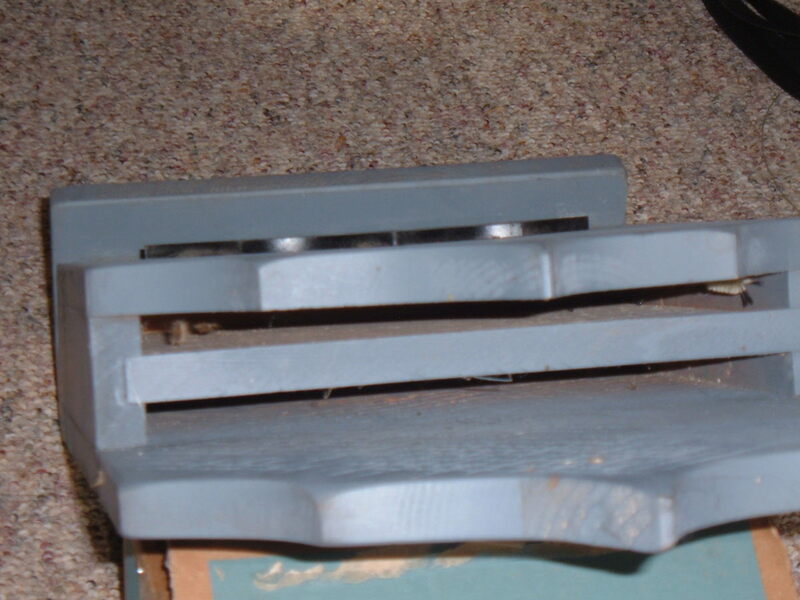 The roof (part A) of the bat box was cut slightly over-sized to allow secondary cut at a 22 1/2 degree angle to match the top of the back (part C) and the sides (parts B).Milling the back edge of the roof to a 22 1/2 degree angle improves the visual appeal and makes it easier to eliminate drafts and to waterproof the joints between the roof, back and sides of the bat house. 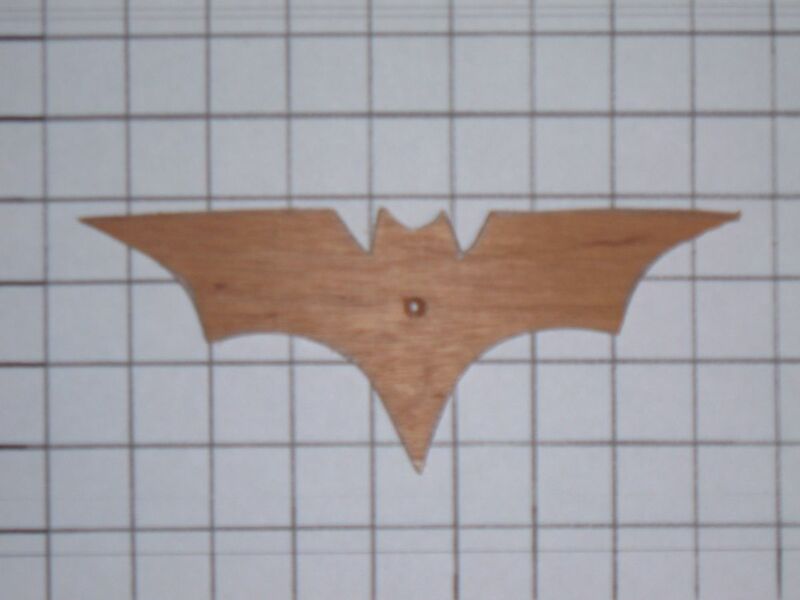 If you have a table saw, tilt the blade to 22 1/2 degrees, set the fence to the finished width of 5 3/4" and then run the piece through..
To create the scalloped bat wing shapes on the back (part C) and on the front pieces (part D), use the drawing as a guide to create a pattern out of heavy paper or lightweight cardboard. I find it easiest to create a "half pattern", which is essentially just one side of the pattern (one half of the wing). Center the half pattern to trace one side of the bat wing, and then flip the pattern over to trace the other side, creating a mirror image. Cut out the bat wing shape, and then soften the cut edges with a rasp or sandpaper. If you have access to a router, a 3/8 cove bit produces a nicely finished edge. Bats need a rough surface to land on and to cling to, and they will have difficulties grabbing on to the smooth surface of the board. There are several ways to roughen the inside surfaces of the front (part D) and back pieces (part C) of the bat house, as well as both sides of the divider (part E). 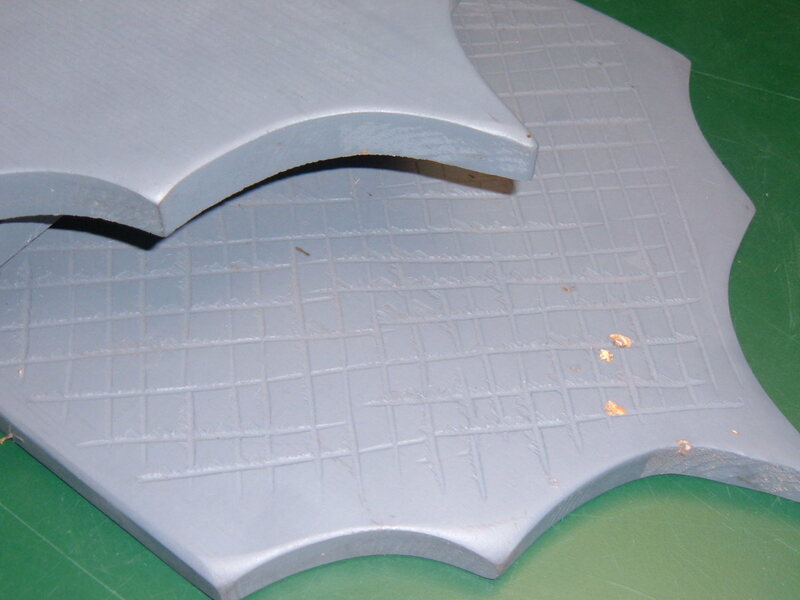 One of the easiest and most effective is to use a hand saw to repeatedly score the board's surface. Position the saw across the board, at a slight angle rather than straight across. A couple of back & forth strokes will score the surface. 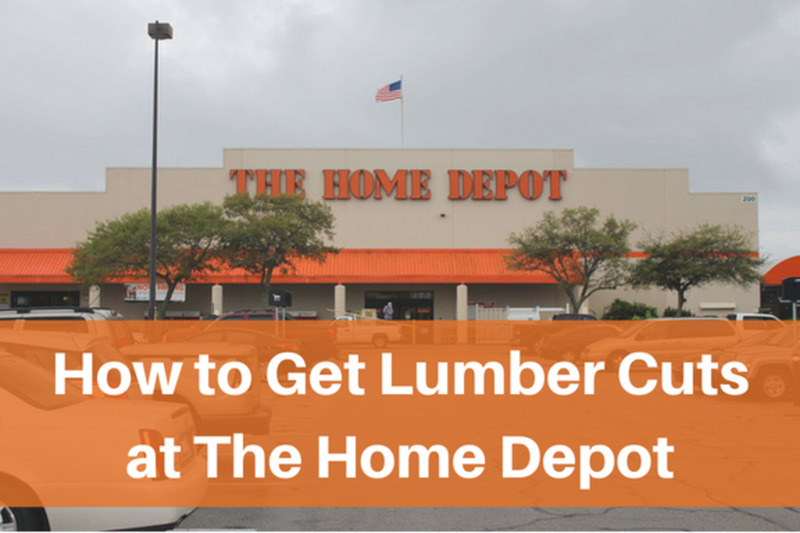 Reposition the saw a 1/2" from the first score line and repeat until you have covered the interior. Since the top bevels are already cut to attach the roof of the bat box, check twice to ensure that you are scoring the insides of back and front pieces. Now, re-position the handsaw at the opposite angle, so the resulting score line will cross the original score lines at an angle, creating a series of diamond shapes between the score lines (see photo). Continue the scoring until you have covered the interior of parts C, D and E, including the lower landing section of the back (part C) which extends down below the bat house. Lightly sand the score marks to remove any splintered edges. Assembling the bat box is straight forward and it can be simply glued and nailed or secured with screws; just make sure that the screws, nails and glue are all rated for exterior use. I used an exterior grade of yellow glue together with galvanized 1 1/2" finish nails to secure all of the pieces. Before gluing or nailing, dry fit all of the pieces together to see if any adjustments are needed -- especially the width of the divider which needs to fit between the sides in the assembled bat house. It's much easier (and less frustrating) to test fit the pieces together now to make any final adjustments rather than trying to make changes after the bat house is halfway assembled. One you are satisfied with the test fit, its time to begin the actual assembly of the bat house. I find it easiest to begin the assembly by attaching the sides (part B) to the front (part D). Position the sides on their back edge (the long side), and then lay down a bead of glue along the length of the front edge of the side pieces. Now position the front piece across the sides, ensuring that the scored section of the front piece is facing down towards the inside of the bat house. Also, line up the bevels at the top and then attach with nails or screws. It can take a year or more before a colony of bats find your new bat house. Flip the front and side assembly over on the workbench, spread a bead of glue along the long edges of the sides. Position the back (part C) and line up the bevels before nailing it into place. Then position and attach to the roof (part A) using glue and nails. The last piece to nail into place is the divider, which separates the inside of the bat house into two sections. 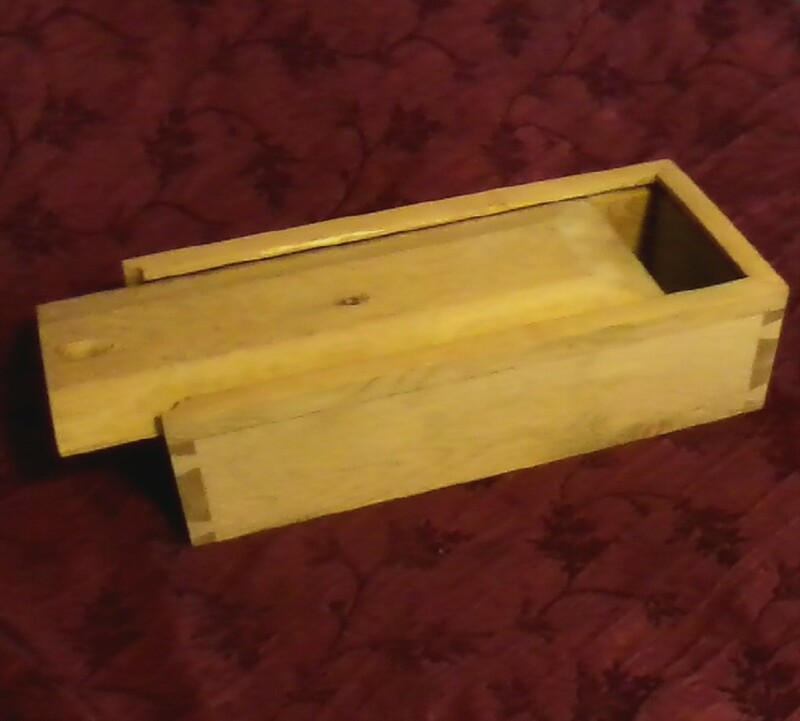 Since the opening is 2 1/4" wide, and the divider is 3/4" thick, positioning the divider in the middle of the opening will create two 3/4" wide chambers. With the bat box on its back, place two temporary spacers on the inside of the bat house, position the divider and then nail it into place. Now, just remove the temporary spacers and the divider is centered in the bat house. Bats like warm, dark places for roosting and rearing their young. 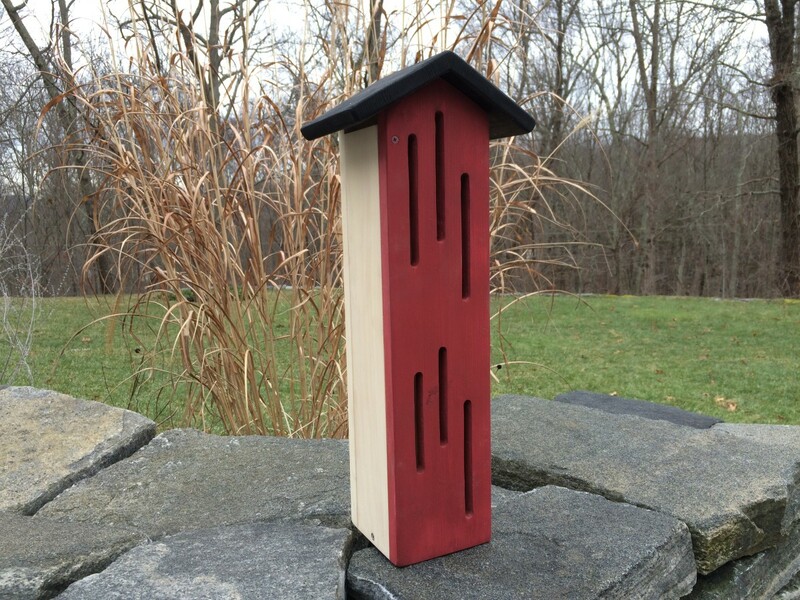 To help absorb and retain as much heat as possible, painting or staining the bat house with a dark color is recommended. Lightly sand all of the corners and edges, for both a finished look as well as to help the paint adhere better. If there are gaps at any of the joints, seal the openings with an exterior caulk. 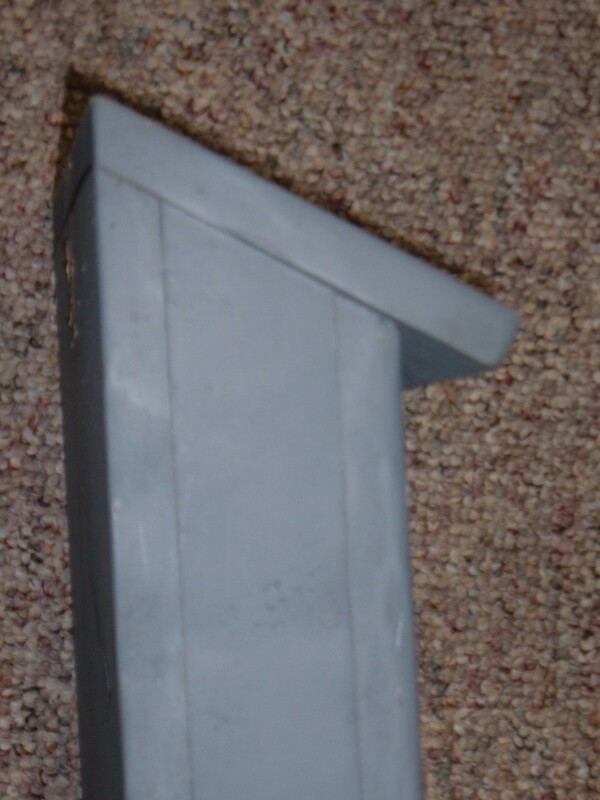 I painted the bat box with three coats of a dark gray, flat exterior spray paint. 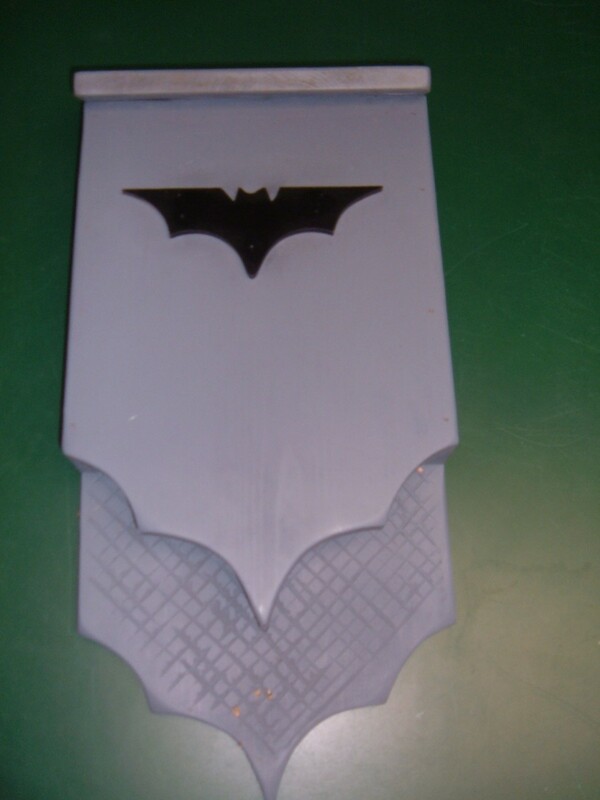 To make the bat silhouette for the front of the bat box, draw an image of a bat with out stretched wings from a Halloween or similar model, or search web sites for anything bat-like to suit your taste. My version was derived from a movie advertisement, and drawn onto a thin piece of cardboard. The dimension is approximately 3" high x 8" long. I traced the cardboard pattern onto a thin piece of scrap plywood, and then painted it glossy black before attaching to the front of the painted bat house with glue and small nails. Hang the bat house facing an open area, preferably with a southern exposure to maximize the amount of warmth from the sun. The bat house should be mounted at least 10' up from the ground, and higher if possible. 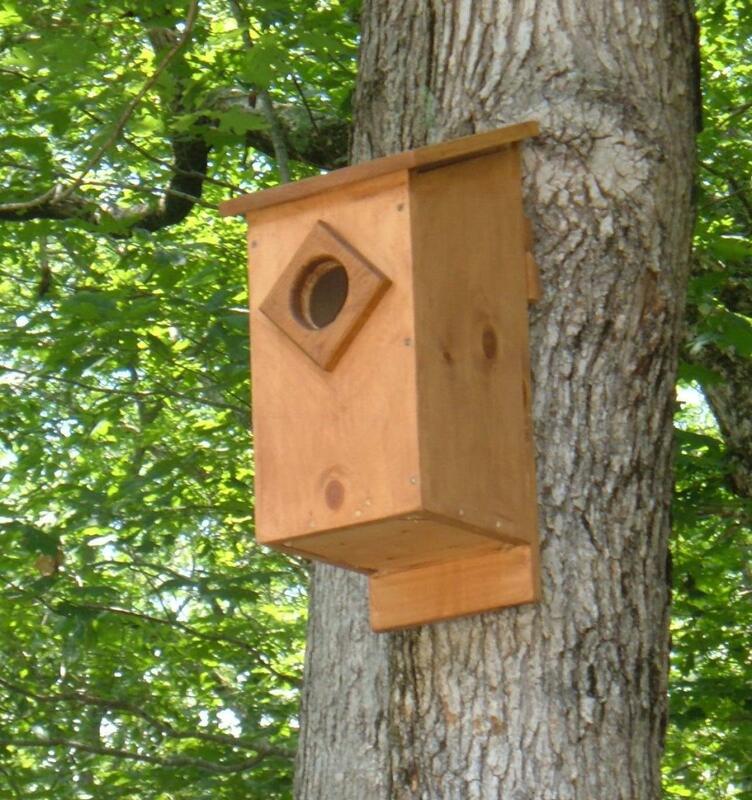 The bat house can be mounted to the exterior of a building, or attached to a pole or a tree. 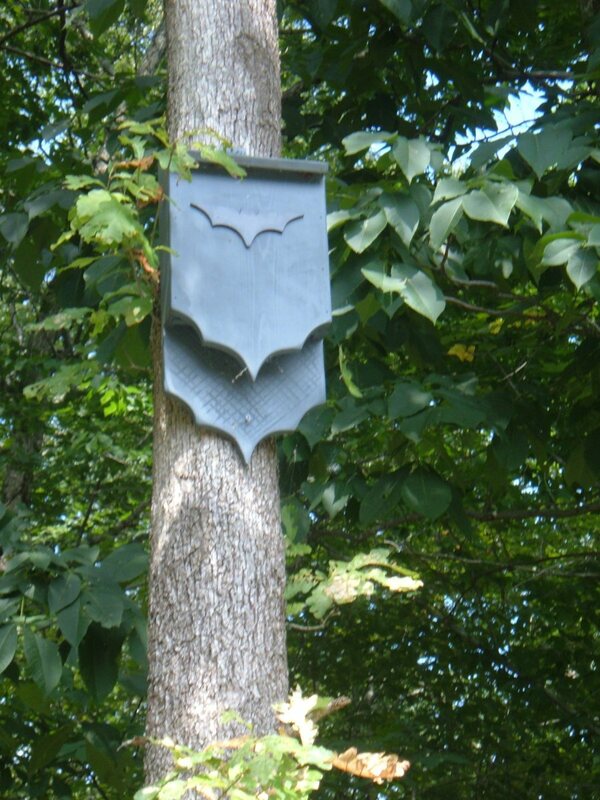 Bat houses can be mounted at any time of the year, though bats are usually searching for new homes in the late winter and early spring as they emerge from hibernation or begin their annual migrations (depending on your geographic location). 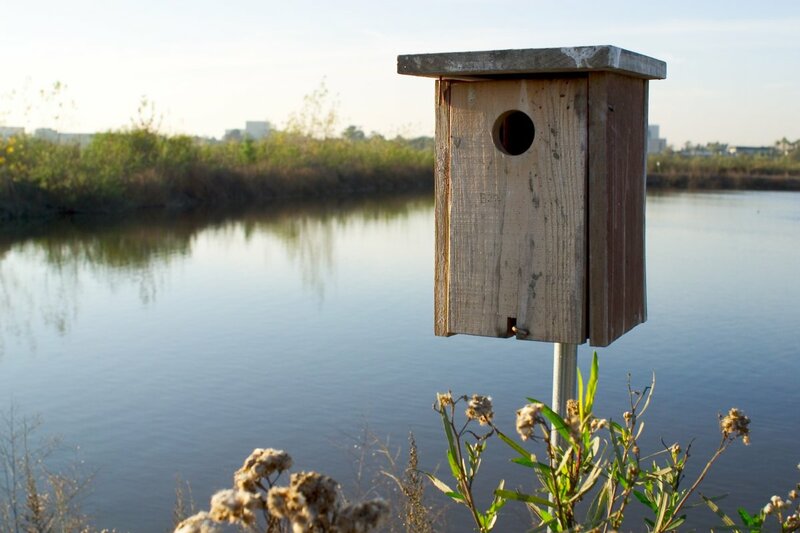 Don't be discouraged if your bat box does not immediately attract any new residents; it can take time for the bats to find your "for rent" sign and move into their new accommodations. From the Bat World Sanctuary web site website: "In a world where so many look away, Bat World Sanctuary is on the front line to end the abuse and destruction of bats. We are recognized as the world's leader in bat care standards and cutting-edge rehabilitation treatments, and we created specific guidelines for excellence in bat education programs that are used worldwide. Each year we rescue thousands of bats who might otherwise die. Lifetime sanctuary is given to non-releasable bats, including those that are orphaned, injured, confiscated from the illegal pet trade and retired from zoos and research facilities. Bat World Sanctuary was founded in 1994 and is a 501c3 non-profit, all volunteer organization with 20 rescue centers nationwide. Donations allow us to continue our rescue efforts for bats. You can help us save bats by educating others about their plight, and by donating to Bat World Sanctuary." Please visit the Bat World Sanctuary web site for more information. Fantastic! I remember the bats that lived near my grandparents' cottage chimney, back in the 1940s. When we were out at night, we children would see the swarms of bats, but we were frightened by them. Thanks for showing me that we really need bats, as a natural means of insect protection. Your tips and instructions are top notch. With bats eating 100 insects every night and many of those being mosquitoes, those who built bat houses are smiling now, a great natural way to win the battle! I love bats - I love your lens! This is a marvellous idea, making a bat house to help bats. It is so disgusting how so many people believe nonsense about bats, even today. In my local area, there are regular panics about 'bats spreading communicable diseases'. Nonsense! We welcome bats in our yard; in this area they roost in trees, and we have plenty of old ones (lots of branches, lots of fruit to eat) that the bats love. And it's so special to look up in the evening, and see the bats flying over on their way from wherever to wherever else. Thankyou for being so innovative and thoughtful; I hope your bats enjoy the bat house/s you build for them. I think that it is a little batty how quickly the sprinkle of magic dust disappears so I am just fluttering by to replace it. Hope your spring is going wonderfully and the bats in your neighborhood are busy munching out on their fair share of mosquitoes. I've always adored bats, and think they are so very cute. Sadly, we have no place to put one of these where we live, but I totally support all who give bats their own little homes. Great ideas on attracting bats. There are limestone cliffs with overhangs and small caves near where I live, and I enjoy seeing the bats dart through the sky after mosquitoes at twilight. I read years ago that bats eat their weight in bugs so although I may find them to be a little spooky I truly do appreciate their role in bug control. Man and the other creatures which inhabit this earth really do have to learn to live together in harmony. Once again you have created an amazing article. I love your works. There are lots of bats living near us. One of the local public gardens builds bat houses and people always ask "what are those?" Your design provides the clue. We love our bats and really should make a few of these shelters for our own garden. We had a bat hanging off the side of the house this summer so I know they are around. It would be nice if we had a few bathouses as I would enjoy less of a mosquito population. Between the bats and the dragonflies, we would be all set. Thanks for this! I'm going to have to use it when my hubby and I get a house. We want to have a bat house for sure. Building a spooky bat-house might be just the right thing for Halloween. A bat house is on my wishlist. But I will buy rather than build - I'm not that handy. @purnimamoh: Hi, and thank you for visiting. Bats do not attack humans. They are very beneficial, with most species eating hundreds of insects every night. Other species are pollinators. Even the dreaded vampire bat feeds mostly on cattle. Very nice site. I appreciate the ecological concern and the simple techniques used in making this wonderful activity. However, I have a question. Do bats attack human beings? Bats as owls are night birds, I love both~! Bats are amazing indeed... We have a lot of them around and we are happy to have them because of mosquitoes and flies they catch. I am afraid the new shopping mall will cause too much noise and they will go away. Your recipe could come handy, thanks! 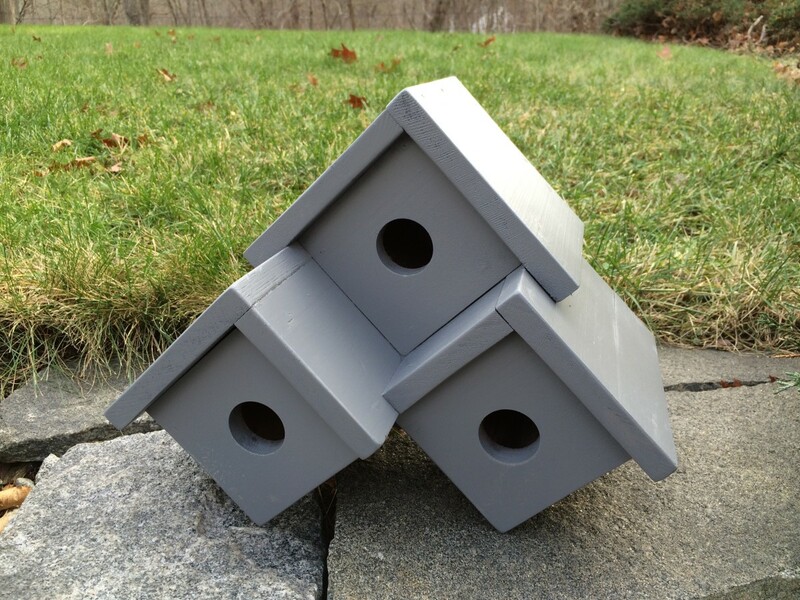 Great design for a bat house, and your instructions and photos tell clearly what to do. We have a couple trees in our yard that would make good places to secure a bat house. I LOVE your bat house design! We've been wanting to make one for years, but just haven't found a design that we liked. I'm showing this to my hubby. "Hey, honey...got a project for you!" Nice and simple Bat house design..thanks! Might be helpful to have the measurements in Imperial (inches) and Metric (centimeters) but still a helpful resource. Very nice bat house. These are very helpful creatures. Love your bat home ... and for the info on bats.